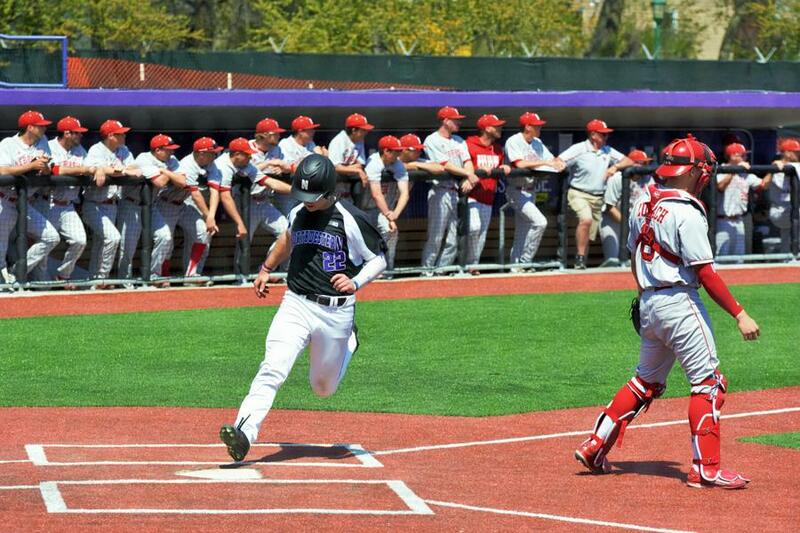 RJ Watters crosses the plate for a run. The junior outfielder made the most of his starts over spring break, including a diving catch at the warning track Sunday. When Jake Stolley steps onto the mound Wednesday afternoon, he’ll accomplish two firsts with one pitch. The senior will make the first start of his collegiate career after 47 relief appearances over the past three seasons. And Stolley will throw the first-ever pitch in the renovated and renamed Rocky and Berenice Miller Park, which is finally ready for play after a year and a half of construction. “The whole team is really antsy. They said they’d let us in the locker room tomorrow after the game if we play well, so we’re excited for that,” Stolley joked. Behind Stolley, the Wildcats (6-18, 1-2 Big Ten) will seek to snap a slump of 14 losses in their last 16 games with their home opener against Chicago State (6-16, 0-3 WAC) on a momentous day for the program. Renovations on the formerly named Rocky Miller Park, originally built in 1943, have replaced the playing surface, built new locker rooms and a larger press box, enlarged spectator seating and improved other amenities. NU will debut the stadium Wednesday after playing its first 22 games of the season on the road. The Cats dropped their first conference series to Ohio State (15-7-1, 2-1) last weekend, winning the Friday opener but then losing back-to-back games, including on a walk-off home run Sunday. Junior outfielder Jake Schieber said although NU tried to keep focused against the Buckeyes, they were still distracted by thoughts of finally returning home this week. “It’s going to be good to be home, get some home fans coming too (and) not always be playing against the opposing team’s crowd,” Schieber said. The visiting Cougars have had their own struggles so far in 2016, losing six straight contests by a combined 58-12 score before beating Western Michigan 6-3 on Tuesday. They’ve also traveled the country extensively, playing series at Hawaii and New Mexico State this month. NU has enjoyed plenty of success against Chicago State in recent years, winning at least its last nine meetings dating back to 2012. The cross-city rivals will complete the second half of their 2016 home-and-home series on April 19. Reynolds, perhaps aware of the favorable matchup, said the coaching staff decided to start Stolley to help him regain control after a stretch of poor relief appearances. The senior has surrendered six earned runs in just 2.2 innings pitched over his last four games. Facing a beatable opponent after a brutal first portion of the season, the Cats will hope to build upon the positives of last weekend’s tight series and earn a much-needed win. The day’s biggest story, however, won’t be the result of the game but the confines in which it is played.